Born in 1955, Bennie Ration has been smithing silver since age eleven. His specialty is three-dimensional figures, often including hand-fabricated holloware kachinas made into pins, pendants and necklaces and shadowbox pendants with cut-outs. He is particularly adept in "saw and file work" which he often uses to sculpt the edges of his pendants. 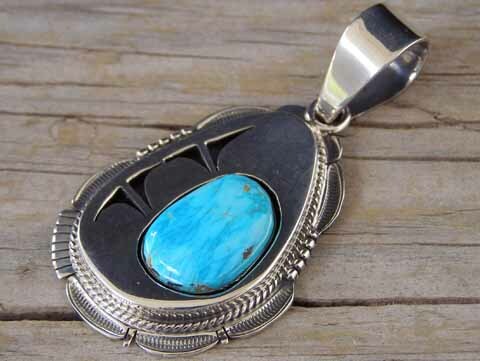 This pendant is a perfect example of Bennie's fine detail in hand-fabricating shadowbox jewelry to use the elements of light, depth and texture merged with classical elements of American Indian jewelry such as cut-out geometrics and highly detailed, sculpted borders created with careful use of the silversmith's saws and files. Beautifully set in shadowbox fashion is a free-form stone of stunning baby blue natural, untreated Royston turquoise from Nevada with highlighting geometric cut-outs. Hallmarked BENNIE RATION under a set of eagle talons and stamped Sterling on back. Dimensions of pendant (excluding bale & jump ring): 1 3/4" x 1 3/8"
Total hang (including bale): 2 5/8"